Join us on Saturday, October 20, 2018, as a volunteer alongside thousands of New Yorkers in one of 35 high-need public schools across the five boroughs to brighten classrooms, hallways, and futures. Cares Day Teams pledge to revitalize a NYC school from the inside out, all while raising funds to power year-round education programming. At the cornerstone of New York Cares’ mission to meet pressing community needs is a commitment to Education. New York Cares believes that education, and the state of a students' learning environment, is fundamental to development and opportunity. 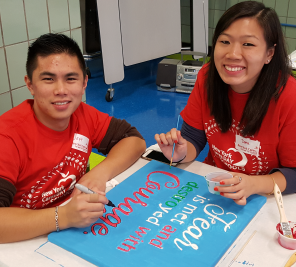 Last year, over 2,500 volunteers took to 38 Title1 New York City public schools for 5 hours. That's over 12,500 hours of work, adding up to a little over 520 days, which shakes out to almost a year and a half worth of volunteer power packed into a single day. Cares Day sends the message that we're all in this together. That every playground, mural, and student is worth our time. We've done it for 26 years, and we can do it again – with your help. Help us create a safer, cleaner, and more organized learning environment for New York City students to learn and grow. In 2017, New York Cares ran over 10,000 projects in elementary schools, assisting students with their homework, math, and reading skills. Last spring, New York Cares volunteers consulted with 800 students and their families to help them obtain more than $2 million in potential financial aid for college.